In this article we will learn that how to make as assembly in C#.net or how to make class library in C# using visual studio 2008. From File menu, click ‘New project’ (ctrl + N). From Templates window, select Class Library. Enter valid name of your Class Library (in this example we enter ClassLibrary1). Your class library is created successfully with class Class1. Write a new function ‘GetRectangleArea’ in ‘Rectangle’ class. 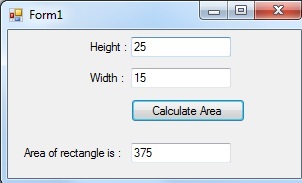 GetRectangleArea function takes two parameters (both are integer, it makes a calculation and then returns the result as area of rectangle. Save project, click File menu and then Save All. Build the project using Build menu, click on Build Solution. From Templates window, select Windows Application. Enter valid name of your Windows Application (in this example we enter WindowsApplication1).